January 16th, 2018 - Coral Springs, FL - How does New Found Glory top the fun, nostalgia, and success of the 20 Years of Pop Punk Tour in 2017? With the announcement of the Sickest Tour Line Up! The Sick Tour will kick off in May with support from Bayside, The Movielife, and former Yellowcard vocalist Ryan Key. Not only will Ryan Key be opening with his first solo tour, he will also will be performing with New Found Glory as a touring addition to the live show adding another layer to the energy every night. Fan Club Presale Tickets are available now with exclusive bundles including a Soundcheck Party, an exclusive 7" variant with "20 Years From Now" and 2 new songs, Makes Me Sick vinyl slip cover, a Makes Me Sick Deluxe Edition CD and a signed poster at http://newfoundglory.shofetti.com/. All additional tickets will be available Friday, January 19th at 12pm Local Time. 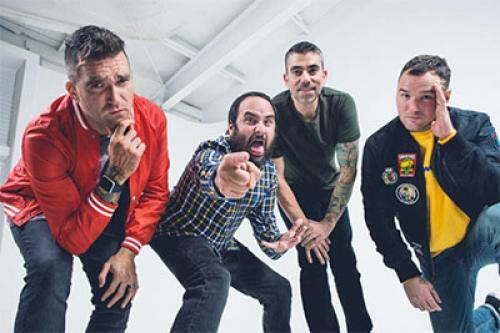 New Found Glory toured for the majority of last year celebrating their 20 Year Anniversary, playing 2 records in full every night from the band's 70+ song catalog. This will be the first opportunity for fans to mosh and sing along to songs from the band's most recent release, Makes Me Sick. The album landed at the #1 spot on the Record Label Independent Current Albums chart. Additionally, the album secured numerous charting positions including the #2 spot on the Current Alternative Albums, #5 for Top Current Rock Albums and the #39 spot on the Billboard Top 200. In addition to success with fans, Makes Me Sick made a wave in press outlets like Nylon who shared that "With Makes Me Sick, New Found Glory's latest album, the band continues its history of punk experimentation, raging against the technology machine while acquiescing to it." Additionally, Alternative Press praised that "Makes Me Sick combines the fun factor of albums like Sticks And Stones and Radiosurgery with some of the musical poise and maturity of Coming Home-and, in the process, creates enough slight sonic diversions to give longtime fans something new to enjoy" and Newsday shared that "all these pop-punk anthems champion taking chances and evolving." Fans can purchase the album on iTunes, Amazon, Best Buy or online, and stream it on Spotify.